A Round Up of ALL of Google's April Fools Jokes. Google’s first prank we reported on earlier: Google Maps in 8-bit, especially designed for the ever-popular Nintendo. Secondly, there’s Google Really Advanced Search, which goes beyond anything mere Advanced Search can do, bringing options like “rhyming slang for” and the “this exact word or phrase, whose sum of unicode code points is a mersenne prime.” How we lived without the latter for this long I have no idea. Really Advanced Search even lets you filter by “embarrassing grammatical faux pas” and font. Brin does a brilliant job of convincing you this is legit, even starring in the video below. All jokes aside, if anyone can pull this off, it’s Brin and Page. Have a read of Brin’s announcement of the ‘partnership’ here. Fifth, a lesser known option, Google now lets you change the weather! I could use this here in San Francisco, miserable. Eighth. To add to its already extensive street view coverage in Australia, Google will be strapping 360-degree head-on cameras to more than a thousand Kangaroos to reveal what its cars can’t. The project is called Google Street Roo and you can read the full announcement here. Ninth. You can now have all of YouTube delivered straight to your door (or as a gift to for friends and family) with The YouTube Collection. Delivered in convenient giant packages, organised and divided into categories, you can now get all of your favorite YouTube videos offline on DVD. Tenth. Solving the increasingly frustrating problem of accessing mobile internet on rotary phones across the US, Google is announcing GoRo. GoRo aims to fix the problem that 100% of people using rotary phones have, accessing a website. My grandparents will find this particularly useful. Click here to find a Rotary Site developer. Expect big monetization opportunities here developers. Eleventh is Google Fiber (bar). Yep, we’ve all been wrong, Google isn’t working on Fiber optic ultra-fast Internet but rather Fiber Bars, yes dietary fiber. Google’s bars come with 100 times more fiber than any source of fiber available today. Impressive but a sad day for Kansas. Twelfth, Google Voice for Pets! Thanks to Google’s own “special Voice Communication Collars” you can now record audio directly from your dog or cat’s vocal cords. What’s more, a tiny micro-LED emitter built into the collar projects a keyboard onto the floor, so your pet can tap their front paws to send text messages. A little far fetched but there’ll be a few numbskulls out there who fall for this one. Fourteenth: Google is clearly keeping them coming with its latest prank – interplanetary reporting on Google Analytics. The new feature takes Analytics far beyond just your run of the mill Earth-bound visitors. 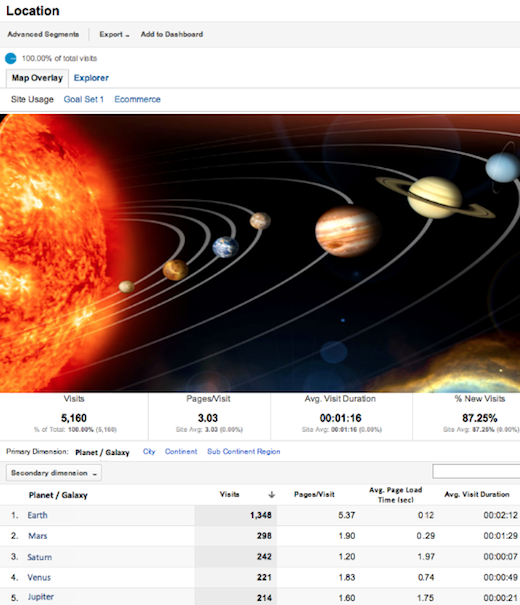 Want to find out about visitors coming from neighbouring stars and planets – with Google Analytics, now you can! Fifteenth belongs to Google’s HR department who reveals details of its Canine hiring process. Believe it or not (hopefully not), Google has a rigorous hiring process for anyone wishing to bring their dogs into work. 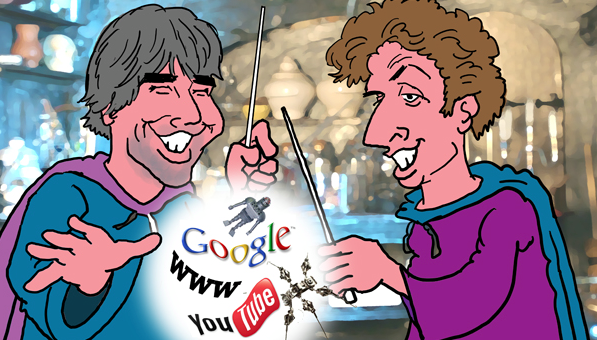 So rigorous that in that in many respects, it equals the processes involved in getting a human job at Google. You can view some candid shots from the interview process for one dog here. “Bloodhounds are a natural fit for Search, while Rottweilers are often drawn to our corporate security positions.” Lol. Sixteenth is a cracker. When you search for Taylor Swift in Google Play on Android, guess who it reveals? Keep ’em coming Google. I’ve got all night. Catch up with today’s latest Google news at TNW Google.